The slow-moving, seven-week-old Soberanes Fire in and around Big Sur continues to burn through Los Padres National Forest to the south, and remains 60 percent contained. As of 6 p.m. Saturday, federal fire authorities issued an expanded evacuation order for the first time in a couple of weeks, indicating that several inhabited areas may be under threat as the fire continues to move under unstable weather conditions. The fire has now scorched over 105,000 acres. The Tassajara Zen Center and Tassajara Road are now under a mandatory evactuation, and the Tassajara team announced yesterday on Facebook that they would begin evacuating non-essential personnel, leaving behind their team of trained fire-fighting personnel. Following the 2008 Basin Complex Fire which threatened to destroy the Zen Center, the secluded retreat now has a sophisticated system of rooftop sprinklers to protect itself from fire. 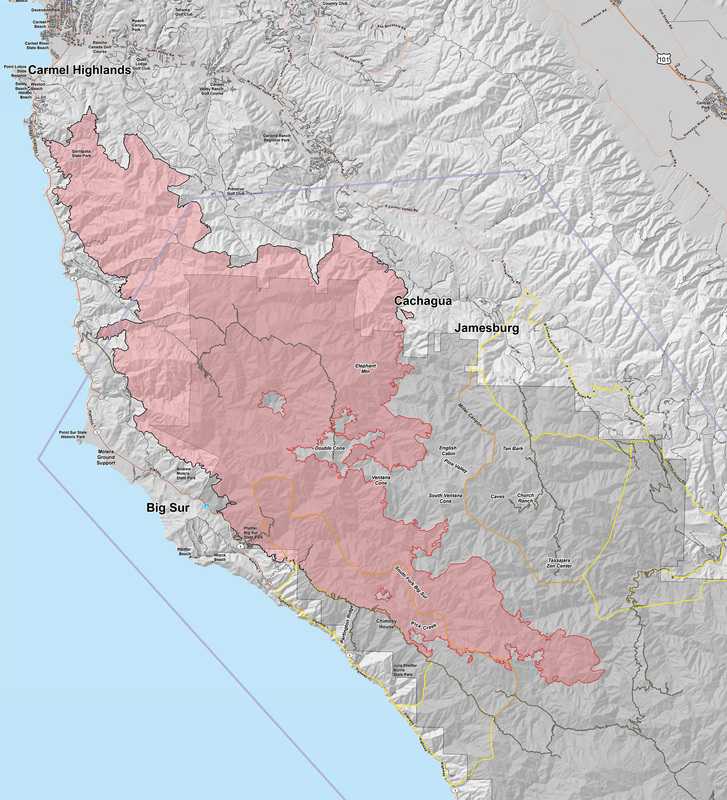 The fire is active on the ridge above the North Fork of the Big Sur River two air miles west of the Tassajara Zen Center and is active above Lost Valley Creek three air miles southwest of Arroyo Seco. An Evacuation Warning has also been issued along the east side of the Soberanes Fire for residents southwest of East Carmel Valley Road from the intersection of East Carmel Valley Road and Piney Creek Road extending to Arroyo Seco Road. An evacuation warning is a precautionary notice that an Evacuation Order may become necessary. Below, the latest incident map, showing the southernmost portion that has grown over the last couple of weeks. Fire authorities have said they expect the fire to be near full containment by September 30.